This article is part of the Counter-Terrorism Portal project of Spinwatch. The Research, Information and Communications Unit (RICU) is a strategic communications unit within the UK's Office for Security and Counter-Terrorism. Based in the Home Office it is also funded by and answerable to the Foreign Office and the Department for Communities and Local Government. The alleged airline plot in August 2006 caused another of the government’s periodic rethinks. For all the work on pursuing terrorists, the government realised that its strategy on preventing more taking their place was not working. 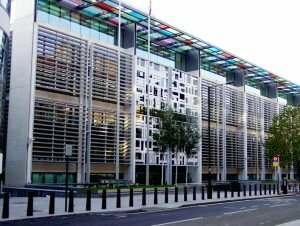 After a bureaucratic tussle, the Home Office has become the centre for a new strategic hub for all counterterrorism policy: the Office of Security and Counter Terrorism. Its task is to analyse the way in which key audiences at home and abroad (in other words, Muslims) react to messages from the government and to try to give more coherence to those messages to undermine the ideology of Al-Qaeda. In the counterterrorist jargon of the day, its job is to build and promote a counter-narrative to the single narrative that Al-Qaeda and its allies propagate. “You can do it without it looking like government propaganda, because if it looks too much like government propaganda then I don’t think people are going to listen, nor should they,” argues Mottram. The RICU is part of the The Home Office. Dec 2008- 33 (including secondees). Home Office figures on the cost of RICU are as follows. 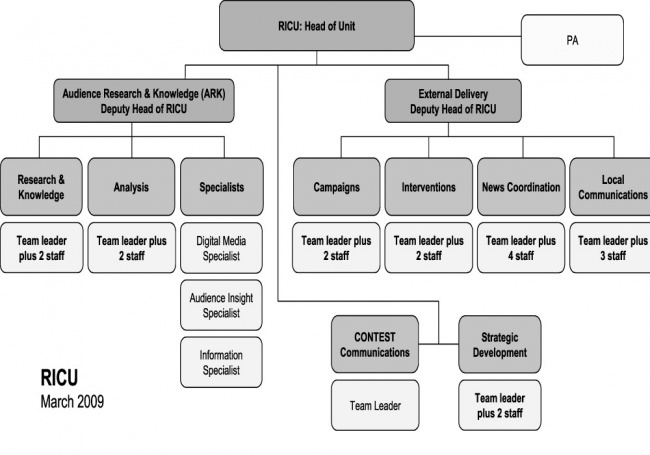 As of March 2009, the RICU consists of the Head of Unit and his Personal Assistant. The Head of Unit oversees two branches. Both of the branches has a Deputy Head and separate teams. This branch includes five teams. This branch includes four teams. All of the above information was provided by the Home Office. Jonathan Allen at a panel discussion called "Words Matter: The Role of Lexicon in Counter-Terrorism Communications Strategy" June 24, 2008. Hosted by the Homeland Security Policy Institute in the USA. The RICU demands civil servants not to use phrases such as "Islamist extremism" and "jihadi-fundamentalist." This is due to the fact that the organization wishes to thwart any ideas of a fundamental connection between islamic beliefs and terrorism. Civil servants are required to refer to terrorism and terrorist groups as "violent extremism," "criminal murderers," and "thugs." On June 24, 2008, Jonathan Allen (head of RICU) was featured at a panel discussion called "Words Matter: The Role of Lexicon in Counter-Terrorism Communications Strategy." The discussion was hosted by the Homeland Security Policy Institute. The other featured speakers were Daniel Sutherland (Officer for Civil Rights and Civil Liberties at the US Department of Homeland Security), and Jeffrey Imm, (research director for the Counterterrorism Blog and former analyst with the FBI). On Tuesday, 7 October 2008 at 15:00, Jonathan Allen, Head of the RICU, spoke at a conference called "Public Diplomacy: Meeting New Challenges" held at Wilton Park in West Sussex. He spoke during a section of the conference called, "How to Change Public Behavior: A Foreign Policy Context." His fellow speakers during this section of the conference included Klavs Holm (Under Secretary, Ambassador, Ministry of Foreign Affairs, Copenhagen), and David Kenning (Chief Strategist, Bell Pottinger Sans Frontieres, London). November 2008, Home Secretary Jacqui Smith met with Pakistan's Information and Broadcasting minister Sherry Rehman at the House of Commons to discuss bilateral issues and combating terrorism. Smith said that military force alone will not stamp out terrorism. Smith discussed the British counter-terrorism strategy, which is the RICU, with Rehman. Smith said that the RICU "...plans advances and amplifies the objectives in today's crowded mobile world." She then said that Rehman has Britain's support in creating and implementing a similar organization in Pakistan. Rehman discussed Pakistan's problem with terrorism using the assassination of Mohtarma Benazir Bhutto as an example. The Guardian reported in May 2016 that RICU had used communications company, Breakthrough Media Network to undertake the 'Help for Syria' campaign, seeking to advise on how to support Syrian refugees without revealing government involvement. Youth Segmentation: A project that looked at how young British Muslims felt about their identity and sense of belonging. Completed. Period of Research - Early 2008, Research company contracted Define Research. Online Behaviours: A project that studied how young British Muslims use the internet. Project has been completed. Period of Research - March-April 2008, Research company contracted Connect Research. Credible Voices: A project that studies why some voices are more credible than others to Muslim communities. Project is currently underway. Audience Insight Qualitative Phase I: A project that looked at understandings of 'Britishness' and terrorism and where these feelings come from within the British population. Project has been completed. Audience Insight Quanititative Phase II Segmentation: A survey of attitudes, behaviours and general demographics of the British population. Project is currently underway. Audience Insight Quantitative/Qualitative Phase III Evaluation (Pilot): A qualitative and quantitative study of shifting attitudes across the population. Project is currently underway. The RICU was created as a result of the advice of Dr. J. P. Macintosh, who is currently the head of the Advanced Research and Assessment Group (ARAG) for the Defence Academy of the United Kingdom. "He catalysed the use of a "war room" facility to begin building the capacity needed to transform the Home Office. His advice was "instrumental in the creation of the Office of Security and Counter Terrorism (OSCT) and the Research Information & Communication Unit (RICU)." Home Office List of RICU Documents Produced and No. of Non-doscloable Titles and Their Ref Numbers, Freedom of Information Request – our reference 11685, 7th July 2009. Paul Smith, APCO/NCSB Police Advisor, RICU Local Communications Team, date unknown. RICU RICU AUDIENCE ANALYST INFORMATION FOR CANDIDATES, 2008. RICU-03-07	Core Counter Terrorism Language and Messages	For all CT communicators: guidance on effective communication with British Muslim audiences. RICU-04-07	Co-Ordinated Communications	Short paper discussing RICU’s remit to co-ordinate government communications work. RICU-05-07	Islam the Basics	Paper looking at Origins, Beliefs, Everyday Practices, History, and Sects of Islam and Islam and Culture. RICU-07-07 Title witheld by Home Office on grounds of 'national security'. RICU-08-07 Title witheld by Home Office on grounds of 'national security'. RICU-09-07 Title witheld by Home Office on grounds of 'national security'. RICU-12-07	Counter Terrorism Communications Guidance	(Unclassified version of RICU 03/07) For broader range of communicators: guidance on effective communication with British Muslim audiences. RICU-13-07 Title witheld by Home Office on grounds of 'national security'. RICU-14-07 Title witheld by Home Office on grounds of 'national security'. RICU-15-07	Communicating Shared Values	For CT communicators at national, local and international level: Preliminary *RICU guidance on understanding and communicating possible shared values. RICU-16-07	Muslim Grievances	For CT officials and wider delivery audience beyond immediate CT community: guidance on identifying and addressing a range of political and socio-economic issues exploited as “Muslim issues” in the promulgation of a terrorist narrative. RICU-17-07 Title witheld by Home Office on grounds of 'national security'. RICU-18-07 Title witheld by Home Office on grounds of 'national security'. RICU-19-07	CT Bill 2000	Guidance for those with responsibility for communicating or discussing the Counter Terrorism Bill. It consolidates RICU communications analysis and advice around the Bill, including recommendations on how best to communicate proposals, focussing in particular on pre-charge detention. RICU-20-07 Title witheld by Home Office on grounds of 'national security'. RICU-21-08	Terrorism what do we call it	For Whitehall, local and international partners: think piece on defining and talking about the nature of the terrorist threat facing the UK and its underlying ideology, without apportioning undue blame onto particular communities or a religion. ↑ Ian Cobain, Alice Ross, Rob Evans and Mona Mahmood, Revealed: UK's covert propaganda bid to stop Muslims joining Isis, Guardian, 2 May 2016. ↑ 18.0 18.1 18.2 18.3 18.4 18.5 18.6 18.7 The Home Office maintained the following as its reason for non-disclosure: 'he details of these documents are withheld in reliance on section 24(1) of the Freedom of Information Act. Section 24(1) of the FOIA provides that information can be withheld where exemption from disclosure is required for the purpose of safeguarding national security and where the public interest falls in favour of non-disclosure. Considerations which favour the disclosure of the requested information in this case include the promotion of openness and transparency in government, the benefits of greater public knowledge regarding matters of national security and the particular public interest in further information being put in to the public domain regarding the provisions of the Prevention of Terrorism Act 2005. Home Office List of RICU Documents Produced and No. of Non-doscloable Titles and Their Ref Numbers, Freedom of Information Request – our reference 11685, 7th July 2009. This page was last modified on 21 May 2016, at 12:52.